Specific wavelengths of blue light target the p. acnes bacteria that play a significant role in causing acne for many people. The light causes the development of oxygen radicals that kill p. acnes bacteria without damaging healthy skin. It is best used to reduce inflammation and destroy p. acnes bacteria. Treatments need to be done a minimum of twice a week for 4 weeks. Some individuals may require more treatments. Celluma LED treatments may be recommended initially in treatment to help get inflammation down and then procede with other acne reducing treatments. If inflammation is the only type of acne an individual has ( which isn’t the norm) then you may opt to do just the Celluma LED Light Therapy treatments and use of home care products to achieve results. 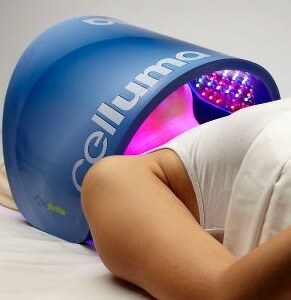 Who is not a candidate for Celluma LED Light Therapy?